GDP – should joy be unconfined? 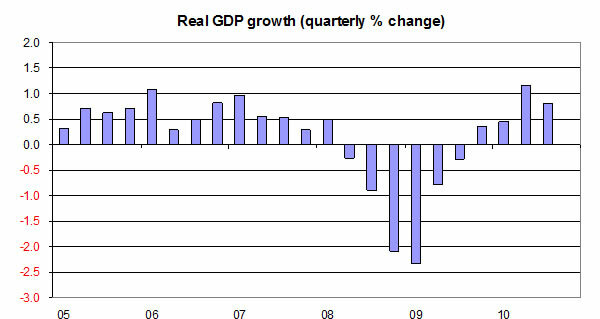 The news-of-the-day so far would seem to be the announcement that the country’s GDP figures for the third quarter of 2010. In case you missed the figures released by the Office of National Statistics, it grew by 0.8%. That may not sound a huge amount but it’s twice what economists had forecast and so, in Whitehall, joy appears unconfined. Of course, this announcement can be looked at in two ways. The Coalition wasted no time in using this growth, measured from July to September, to say how good the cuts announced six days ago are for the country. On the other hand, the Opposition are attempting to get across the fact that this 0.8% growth is a drop on the previous quarter which showed 1.2% growth. Spinners from both sides will be out in force today touring the newsrooms and studios. The growth appears to have been led by a huge bounce back in the Finance, Construction and Manufacturing sectors which had all been severely depressed in 2009. If productivity in these sectors then goes on to slow in 2010/11 (as is likely when public sector construction and manufacturing contracts get cut), the overall growth rate is bound to drop. January is also bringing a rise in VAT as well as spending cuts in the public sector, both likely to have a negative effect on spending in the new year. Such a slowing in spending in 2011 seems very likely to bring growth almost to a halt which will create big trouble for the Coalition Government. Especially since David Cameron’s speech to the CBI yesterday. It was notable from his speech that Team Cameron are now aiming to talk more about growth after weeks and weeks of cuts. Cameron tried to push a growth agenda with the CBI without ever having any specific plans to create it. This is an easy speech for Cameron to make. He’s very comfortable talking to business leaders and telling them about his “relentless focus on growth”, despite having very few courses of action open to him. Following the Tories’ ideological cutting of the State, what kind of strategies for growth can Cameron carry out? Dave seems to be unwilling or unable to come up with a specific plan to create growth in the country beyond some laissez-faire idea of letting the private sector create wealth for the nation. It doesn’t bode well. The CBI response to Cameron’s speech has been to say that growth cannot be created on a policy of cuts. Of course, this comes only a couple of weeks after they were making demands for the same cuts as well as demanding cuts to business taxes and regulatory controls , so I’m not altogether sure why we should take too much notice of them.